Over the holidays, I was able to visit Boston again. Since I’ve been working on this series, this time, Melissa and I ventured to Concord. We started with a nice lunch and then went over to the Old North Bridge. To borrow from Julius Ceasar, Concord est omnes divisa in tres partes. Though Concord was a small farming village, the Concord River and the Assabet River that flows into it, divide the town into three separate parts. To get from the main part of town to either north or western parts of Concord, you need to cross the Concord River using either the Old North Bridge or the South Bridge. Thus, if you wish to occupy the entire town, your troops will have great difficulty supporting each other. On the other hand, if you only want to occupy the center of town, you could post small contingents at each bridge and be able to send your main force to reinforce whichever gets threatened. The west end of the Old North Bridge is on a flood plain and is dominated by a ridgeline directly north of the bridge. A battery on that ridge, supported by infantry would easily prevent any passage over the bridge. The range of the smooth bore musket would not cover the bridge, but with the flat and perhaps marshy ground leading up to a steep slope, no sensible officer would launch an attack over the bridge and at such a battery. That open ground was reportedly flooded at the time, keeping any advance to only the road. Without any artillery, it would still be a formidable position. As noted previously, this expedition was intended to seize weapon caches that colonist had gathered. Within Boston itself, General Gage had negotiated with town leaders to collect all personal firearms in lieu of some kind of forced confiscation. Out in the countryside, it wouldn’t be so simple. Not only had the colonists brought existing weapons to Concord (including cannons stolen from the Boston garrison! ), but they had also started manufacturing firearms there as well. The British were aware of these preparations due to both loyalists and spies. They even had lists of what ought to be found where. Interestingly, down in Virginia, the colonial Governor was able to quickly and quietly secure the weapons gathered in Williamsburg and blame it on concerns about a fictional slave revolt being planned. Having engaged in that brief exchange of fire that was the Battle of Lexington, British troops marched west to their goal. Colonial minutemen had been gathering at Concord for hours, due to the rapid spread of the alarm. Initially, they began to march on Lexington, but turned back once they learned that the British column outnumbered them. The 250 militiamen turned and marched back to Concord, about 500 yards ahead of the 700 regulars. I was almost like leading a parade back into the village, drums rolling. The militia retired to the highest point in town, 289-foot high Punkatasset Hill, from which you might even see all the way to Boston. LTC Smith divided his troops in order to seize the various weapons caches. He sent CPT Mundy Pole to the South Bridge with the grenadier company from the 10th Regiment. CPT Lawrence Parsons of the 10th Regiment was sent with 7 light infantry companies (about 100 men, reportedly) to both secure the Old North Bridge and raid colonial Colonel Barrett’s farm to seize cannon there. Parsons left half his force under the command of CPT Walter Laurie to guard that bridge and took 4 companies the 2 miles to the weapons cache. Anyone in these regiments with less than 13 years of service would have likely never seen combat, since their last action would have been in the Seven Years War (French and Indian War in the colonies), so Laurie may have been an inexperienced officer. He may even have allowed his troops at the bridge to seek food and drink at nearby houses. Nonetheless, he did post two of his companies on the high ground that directly overlooked the bridge. Meanwhile, the grenadiers in the main force began searching in the main part of town for the hidden weapons, munitions and food. This included digging up 3 large cannons (24-pounders) and smashing their trunnions, rendering them unusable. When setting fire to a few gun carriages, they ended up setting the town’s meeting house on fire. Fortunately for the people of Concord, the troops did assist in putting out the fire. CPT Laurie sent back for reinforcements as the militia swelled, perhaps over 400 men for his 3 small companies of light infantry. The militia was overlooking the Old North Bridge from that commanding height we noted above. Before any help could arrive, Colonel Barrett’s men began to advance on the bridge. The two companies posted on the hill fell back to the bridge, then Laurie pulled his entire command back beyond the bridge. One of his officers began pulling up planks from the bridge to prevent the militia from following them. The militiamen advanced in column up the road toward the bridge, with Major John Buttrick shouting for the regulars to stop destroying the bridge. CPT Laurie ordered his men into a curious formation – forming for “street firing” – of basically matching the militia’s column with his own column. The wisdom of which was questioned by at least one officer,a Lieutenant Sutherland, who ordered flankers out from the rear of the formation. Like most officers assigned that day, he was unknown to most of the men, and only a couple of men followed his counter-order. The exchange of fire that followed left a few men dead and wounded on each side, but lead to the rapid retreat of Laurie’s command. In their retreat, they were met by the reinforcing grenadier company Smith had sent, but all of them fell back on the main force together. The British command did not take this incident as a sign to depart from Concord rapidly. CPT Parsons and his troops marched back to the bridge when they heard the firing, marching through the battlefield and past the militia, which had crossed the bridge but not advanced much beyond that. As this is mainly a review of the failure of the British command in the seizure of a weapons cache, we will analyze their performance. I think that in each encounter during this mission, the British command underestimated the enemy. At Lexington, they had underestimated the defiance of the colonists, but at Concord, they grossly underestimated the numbers that might turn out to oppose them. As the numbers swelled, CPT Laurie seems to be the only one who recognized a problem, but even his response didn’t particularly help. LTC Smith gathered his men, but then spent hours before setting out on his return trip. He did not take the fight at the Old North Bridge as a signal that the militia would attack the regulars. I cannot puzzle out why, given that fight, that he didn’t send a strong force to the bridge to ensure the safe return of CPT Parsons and his other four companies. Perhaps the fact that these companies passed the ‘scene of the crime’ without harassment fed Smith’s confidence that no serious fight could be expected. He and his men would pay the price for this miscalculation over the next several hours. Since Smith knew that the weapons were dispersed, he divided his command to secure them. I would say that he did so in the interest of time, but his failure to depart quickly after being blooded acts as counter-point to that concept. Sending companies to secure each bridge seems prudent, but his underestimation of opposition numbers meant that he didn’t send sufficient force to hold those bridges. His main party proved too far away to support CPT Laurie and, when he did send reinforcements, he only sent a single company anyway. Worse yet, CPT Parsons’ command was nearly cut off with the retreat of troops from the Old North Bridge. Imagine, Smith’s command was a fraction of the forces in Boston; the Old North Bridge force was a small fraction of that; Parsons’ companies were the isolated tip of the spear. Later in the day, let alone later in the war, all of his men would have been killed or captured due to Smith’s command decisions. At Concord, as at Lexington, the ad hoc nature of the officer selection (and the inclusion of a variety of supernumerary officers along for the excitement) meant that neither the officers nor the men were familiar with each other. At the Old North Bridge, the contradiction of orders issued by a Captain and a Lieutenant was especially confusing to the men, as the officers were unfamiliar to them. It surely helped create the disarray that led to the accidental or, at least, undisciplined shot and the ragged volley that followed. The responding fire from the militiamen resulted in the fatal wounding of an officer, wounding of some sergeants and compounded the confusion. It would be interesting to find out how the retreat unfolded and what effect the reinforcing column had on the cohesion of those troops. The final point to bring up in regards to Concord is one that concerns our troops in afield today. What are the rules of engagement? It becomes apparent in reviewing this escapade that no rules of engagement had been formally discussed among the officers, let alone written down. Assuredly, no one communicated any rules that had been formulated to the troops. The action at the Old North Bridge is symptomatic of this problem. CPT Laurie didn’t know how to handle the advancing armed militia, and one of his officers actually followed the orders of the militia’s Major – stopping the destruction of the bridge to protect their position. Then, CPT Parsons’ troops marched right past a few dead regulars, with everyone apparently uncertain what should be done. From the instant I started looking at the Battles of Lexington and Concord from the British perspective, I was struck by the number of mistakes made. I do wonder how much of my compounding analysis is due to a preconceived notion, but I think the preponderance of evidence is that the failure was a failure of command. I will continue to investigate, as I am still a novice in this arena. During our visit, we stopped in Reverend Emerson’s house, now known as the Old Manse. Concord’s minister, William Emerson, preached in favor of resistance to Parliament’s oppression of the colonists and remained faithful to the revolution until his war-time death from dysentery. On April the 19th, Reverend Emerson encouraged the gathering militia to attack once the British column entered Concord, remaining nearby to witness the fight. His grandson is the Emerson most of us think of, author Ralph Waldo Emerson. The important part of that visit was that I got a recommendation on a book about the fight at Concord. While I’m not sure there is a book that deals specifically with the tactics of the short fight (and the effect of terrain on those tactics! ), but Robert Gross’ The Minutemen and Their World does a marvelous job of introducing all the Concord-based participants. It details their pasts, their motivations, their financial and social positions, as well as the eventual fate of each. In our recent trip to southern France, I did manage to squeeze in some time down at Green Beach, where most of the 36th Infantry Division came ashore. Since our stay in France was focused on two weeks in Avignon, Green Beach was quite a long drive – over two hours from our lodgings. The short trip up to the Montelimar battle square was far shorter. 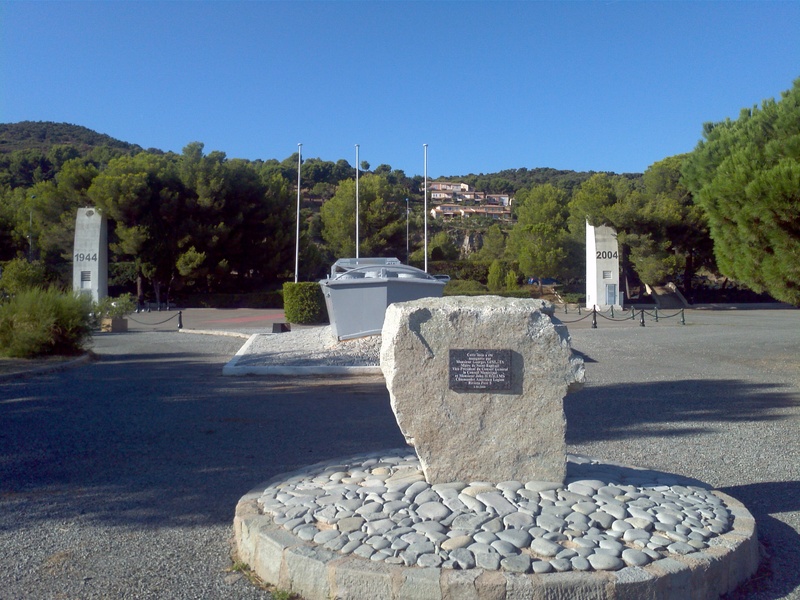 We drove into the area Frejus, having used the A8 highway to come east from Avignon. Having spent a lot of time in rural France, enjoying the quaint and quiet villages, Frejus itself is something of a shock. We kept saying to each other how much it reminded us of going to Ocean City or the Outer Banks of North Carolina, since it was so Americanized. Well, maybe I shouldn’t say Americanized, just commercialized. The long plage in front of St. Raphael is a marvelous sandy beach and bikini-clad ladies parade past statues to the Senegalese troops, to General de Lattre de Tassigny and to Charles DeGaulle. It’s hard to argue with the people enjoying the beaches that were used in the liberation of France, since the soldiers fought exactly so that the beaches could be used this way. It’s still a little jarring to see a band playing for a crowd next to the statues of 5 soldiers who landed here. Nonetheless, seeing Frejus Bay, you can understand how this soft sandy beach could have been a nightmare to assault. With the curve of the coastline and the rough terrain on anything that is not a sandy beach, you’d be landing troops into a kill zone. As they’d attack into Saint Raphael, they’d be exposing their backs to gun positions directly to their west. Since the remote-controlled explosive boats sent in to attempt early destruction of the obstacles were unsuccessful (radio interference likely helped scramble the signals and lead to some of these “drone” boats heading back at the fleet instead of into the beach), the Navy wisely decide to divert the planned landing of the 142nd Infantry Regiment from Red Beach and land them on Green Beach, secured hours earlier with the landings of the 2nd and 3rd battalions of the 141st Infantry Regiment. 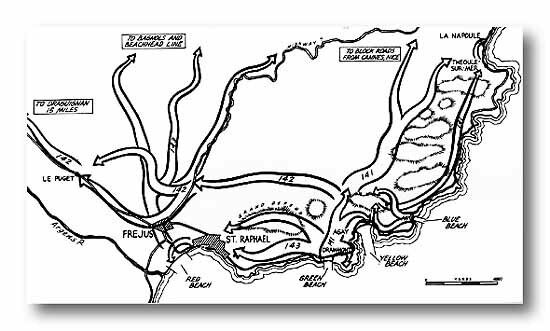 Because the 142nd diverted to Green Beach, where the 143rd Infantry Regiment had followed the landings of the 141st, all of the troops of the Division, other than the 1st Battalion of the 141st, ended up landing on Green Beach. So, it comes as no surprise that when it came time to commemorate the landing of the Division in France, that the monument went up on Green Beach. Of course, when we go to the parking area, I had to race to the beach first (and not just because there was a restroom down there, but that did spur me forward). The map above does not at all convey what the terrain in the area is like. It’s rocky and hilly, imposing and difficult terrain, even with modern roads in place. Looking at the arrows on that map, you get no sense whatsover of how challenging the route along the coast eastward to Cannes really is. Some the materials I’ve read point out the challenge facing the 141st heading along that road. If you drive it, you can certainly understand how a few determined soldiers with machineguns and some explosives could halt a battalion-sized advance. The Germans, having been at war for half of a decade were experts at such actions. Thus, in this terrain, and later in the war in the Vosges Mountains, during the Battle of the Colmar Pocket, small groups in an army which some thought was already beaten, could inflict devastating casualties. This may help explain why, when General Truscott visited General Dahlquist’s headquarters during the battle of Montelimar, saw the terrain and the condition of the 36th Infantry Division troops and refrained from relieving Dahlquist on the spot. As I find so often, when you walk the ground, you gain an understanding that is simply impossible to acquire from books and maps. I wish we’d had more time at Green Beach and been able to visit the drop zones, but mostly, I wish we’d been able to do so with a guide. I could relate some of what I’d read to the places, but it really takes significant study of the history and the terrain to be able to do more than scratch the surface. As I’ve said many times, there is no substitute for walking the ground. Looking at maps, reading unit/battle/campaign histories, or even using my new favorite tool, my tablet, never give you the same understanding as actually being on the ground where the fight took place. We’re over in France and this time we’ve come to the south. This has given me an opportunity to walk the ground at Montelimar. Before we arrived, I’d contacted retired French Army Colonel Pierre Balliot to see if he could recommend a guide. He volunteered himself, driving 200+ kilometers to show us the ‘battle box’. The Colonel has written a marvelous book, of which I now possess a signed copy, entitled La Drome dans la Guerre: La bataille de Montelimar, which details the battle. So, my wife, our friend Tom and I got a half-day tour of the 20 km by 20 km ‘battle box’ in which Task Force Butler, the 36th Infantry Division and French partisans attempted to block the escape of 130,000 men of the German Army from southern France. The battle of Montelimar had the same goal as the sealing of the Falaise Pocket in Normandy, trapping an entire Army Group. So, for me, the Battle of Montelimar is the most important action of the campaign. Walking the ground here, you get a far better sense of why they chose the ground they did, what worked and what did not. The first thing to note is the height of the high ground. While the tablet and Google maps did point out the value of Hill 300, it gave no real sense of the true height or the slope. Somehow, I thought of 300 feet when I read about the Hill. It’s 300 meters or about 1000 feet. The slope is also extreme, making it difficult to dislodge any defenders. The Hill is so tall and long that it completely shields any troops coming up the Rhone valley through that choke point from observation or attack from the east. While there is plenty of high ground north of this, none overlooks such a tight passage as this. Thus, it comes as no surprise that there was tremendous fighting at La Coucourde, where the main road, Route Nationale 7, emerges from behind Hill 300 and where General Truscott had directed General Dahlquist to ‘put the cork in the bottle’, entrapping so many Germans. Dahlquist and Butler faced many challenges here. The terrain that provided such an opportunity was itself a great challenge. The mountains restricted movement, inhibited communication, and provided endless opportunities for ambush. The narrow roads were difficult for armored vehicles and the slopes a great challenge as well. The vast distance from the landing beaches made resupply slow and the lack of sufficient transport compounded that. The rivers helped, but not nearly as much as one would think when looking at the map. Walking the ground at the same time of the year, you see how low they are, how much vegetation would conceal movement and how challenging defending along those lines would be. Looking out from Dahlquist’s headquarters you see how broad a front he needed to defend. Dahlquist himself may have been a part of the problem, never seeming to move fast enough for Truscott’s taste – Truscott flew to his headquarters twice during this campaign to hasten him along. The few troops that reached the fight first shocked the Germans, but a few hundred men, even at strategic points, can only do so much to stop an Army Group. Yesterday, I was able to walk parts of the Brandy Station battlefield with Clark “Bud” Hall, Eric Wittenburg, Craig Swain and 150 of my closest friends. The Loudon County Civil Roundtable arranged the tour. The folks from Civil War Trust were there, and, often during the day, we talked about their ongoing efforts for battlefield preservation. Sadly, I had to head back to Washington early and missed being on Fleetwood Hill and an evening of conversation with my friends and fellow historians. It was a good day, but too short due to my prior commitments. Understanding Battles: Can a tablet replace my books and maps? As I prepared for my talk on the 36th Infantry Division at our Operation Dragoon seminar, I’ve had an opportunity to use my new tablet (a Motorola Xoom) to the utmost. It really is a “killer app” for a historian. My friend, Eric Wittenberg, first wrote about his tentative use of his Nook early last year, then replaced it with an iPad in December. Despite being a software developer in my paid work, I was apprehensive. I love books and maps. The look and feel of each has always been special, and I felt no computer would be able replace them for me. I tried Kindle, first as a PC app, then on my smartphone. Not the same as a ‘real’ book, but quick and easy. With a library of a few hundred books, I never ventured to read history via Kindle. I had too big of a physical book backlog to consider it. Then, I needed more detail on the 36th in less than a week. So, I used Google books to buy “First to the Rhine”. I kept flipping pages to review maps, then realized that I could use Google maps on my tablet. Zoom, twist, slide zoom out, add the terrain overlay. I’m sold. I just hope I can figure out how to Bluetooth or connect to the projector with my tablet because it makes understanding the fight at Montelimar so much easier. Maybe this or maybe at the Colmar Pocket seminar in December. It is an amazing tool. Update: I’ve got a 15-foot mini-HDMI to HDMI cable on order from Amazon so that I can hook to the projector we use at these conferences and to my TV at home for Netflix. Spot on. Great to see midshipmen actually on battlefields….